Jesus said, "But you shall receive power when the Holy Spirit has come upon you;and you shall be My witnesses ...." What is a Christian's purpose on the earth? It is to shine for Christ and share what great things He has done for us and how He had mercy on us. 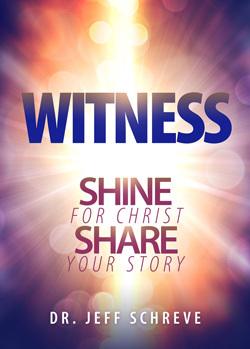 In this powerful seven-message series, Pastor Jeff Schreve shares practical, motivating truths from Scripture to help us become the witnesses Jesus saved us to be. SPECIAL NOTE: The DVD Album contains 4 messages in DVD format and 3 in CD Format. Video was not available for those 3 lessons.